‍The concept of handing control of Chicago schools over to an elected board is backed by incoming-Mayor Lori Lightfoot, Gov. J.B. Pritzker and scores of lawmakers. However, the move - especially the particulars of what the elected board would look like - is not without controversy. Underpinning the debate is why Chicago stands alone in Illinois and among a small group across the country with an appointed board. Chicago Teachers Union members on strike. ‍The concept of handing control of Chicago schools over to an elected board is backed by incoming-Mayor Lori Lightfoot, Gov. J.B. Pritzker and scores of lawmakers. “I think the will is there, it’s just getting the mechanisms and composition right, “ said state Rep. Fred Crespo, who represents the 44th District in the Northwest suburbs, and serves as vice chair of the House Elementary and Secondary Education Committee. However, the move - especially the particulars of what the elected board would look like - is not without controversy. Some, like Lightfoot, warn that a school board of too many elected members could be unwieldy and counterproductive. "I don't want to turn an elected school board into another costly election, which is going to drown out the opportunity for parents to participate," she told reporters in Springfield April 10. Others, like Paul Vallas, a former Chicago Public Schools CEO and recent mayoral bidder, also argue the mayor should have a say in and responsibility for the city’s education system because it is such an integral element of Chicago's economic and social health. But underpinning the debate is why Chicago stands alone in Illinois -- and among a small group across the country -- with an appointed board. The Center for Illinois Politics has also found Chicago’s situation is rather unique across the country. Of the nation's 10 largest school districts, only Chicago, New York City and the state of Hawaii (a single district) are overseen by an appointed school board. 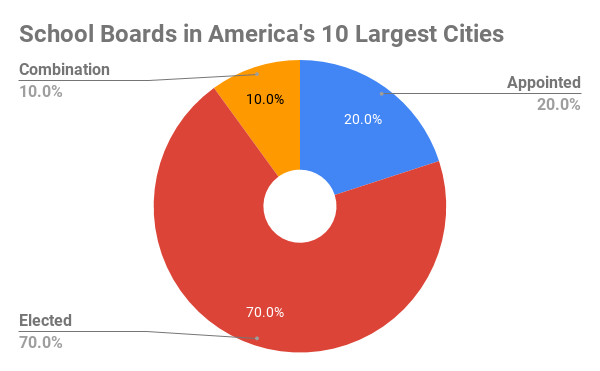 At the same time, looking at major U.S. cities, the composition of public school boards is something of a mixed bag. ‍‍In New York City much of the decision-making for the nation’s largest public school district rests with the 12 appointed members of the city’s Panel for Education Policy, not in its 32 elected school councils. In a unique situation, Hawaii’s education department is overseen by a governor-appointed panel. Other large districts, including Los Angeles, Miami, Atlanta, Phoenix and Houston, all feature elected councils of five to 10 members. Looking at large cities specifically, and not just school districts, Philadelphia has been governed by a five-member School Reform Commission since 2001, three of which are appointed by the governor, two by the mayor. And Boston has a mayor-appointed board of seven members, a change made by home-rule petition in 1991. In Illinois, at least 13 cities once had mayor-controlled school districts, stemming from municipal charters put in place by the General Assembly before 1870, when a new constitution halted the practice. Of that baker’s dozen, only Chicago maintains an appointed school board that harkens back to its original act of incorporation. Lake Forest Elementary District 67 moved from a mayor-appointed board to a seven-member elected board system in 1993, after the League of Women Voters spent several years studying the issue and polling residents. The referendum on the question passed with about 75 percent of voters’ support. 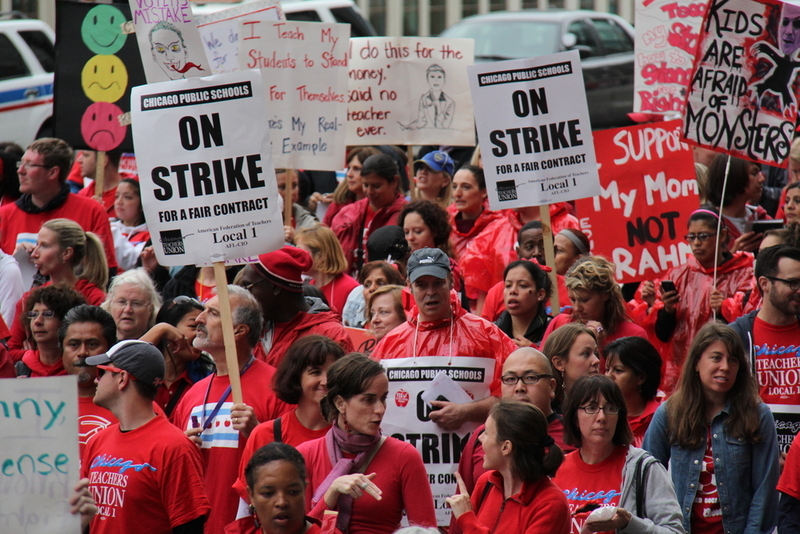 Chicago Public Schools were decentralized briefly, with the implementation of elected local school councils and a school board nominating commission in the late 1980s, following nine teachers union strikes between 1969 and 1987. But those changes were reversed in 1995 when a Republican-led Legislature passed the Chicago School Reform Amendatory Act providing the mayor with power to appoint school board members. The act also replaced the position of superintendent with CEO and curtailed some union bargaining rights. In a twist of irony, the two men named to key roles as those changes were implemented were among the field of 14 candidates vying for mayor. Along with Vallas, Gery Chico was CPS’ Board President. Vallas, who worked in Philadelphia and New Orleans schools after his time in Chicago, argued during the mayoral campaign that a hybrid board of appointed and elected members would serve the city best. The move to an elected school board has been pushed by the Chicago Teachers’ Union for nearly a decade and gained steam after outgoing Mayor Rahm Emanuel moved to close nearly 50 schools in his first term. 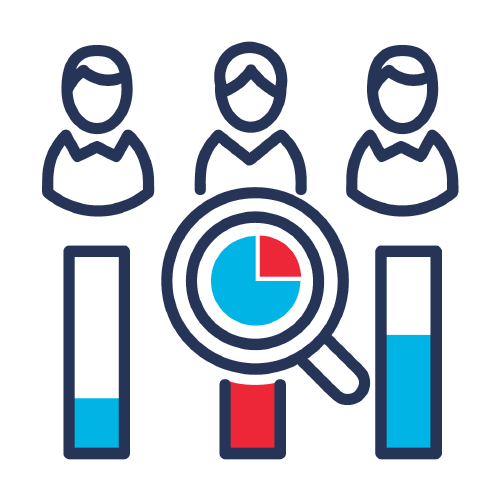 CTU President Jesse Sharkey contends the current appointment system favors those who are politically connected but out of touch with the needs of the district’s nearly 400,000 students. According to last year’s CPS report card, 83 percent of students are considered low income, 37 percent are black, 47 percent are Hispanic and 19 percent are learning English for the first time. Legislation approved by the Illinois House by a 110-2 vote on April 4 would replace the appointed board with a 20-member body elected from city districts whose boundaries would be initially drawn by the General Assembly. Voters would also elect a board president citywide. Lightfoot, who described the bill, sponsored by Democratic Rep. Rob Martwick of Chicago as "highly problematic" Wednesday, has said she'll help "draft and introduce legislation in Springfield to give Chicagoans the right to elect an independent school board." But she hasn't blessed a particular proposal yet. Chicago Democratic state Sen. Antonio Munoz is sponsoring a separate piece of legislation that would create an elected school board of 20 members, all of which would be required to live in the city of Chicago for at least a year prior to their election. But he says he plans to confer with Lightfoot about potential tweaks. Vallas, who has cited reversing a $1 billion structural deficit while at CPS and 70,000 more students being enrolled in the district as evidence of his success in the post during his six-year tenure in the mid-1990s, advocates for a hybrid board that features a mix of appointed and elected members which ensures the mayor the ability to ensure board members have skills to guide the school system, as well as community support. "While the record of appointed school boards is mixed so is that of elected boards," he said. "The debate needs to focus on a selection method that will ensure that school board members are competent, committed and accountable and free from the narrow special interests that can come to dominate school board elections which are notorious for low voter turnout."